Harriet Beecher Stowe, wife of Biblical scholar Calvin Stowe, was an American author who is probably best known for her novel Uncle Tom’s Cabin. The novel depicted the harsh life of African American slaves. The success of the novel led to it being made into a play. The novel and play was said to have reached millions in both the U.S. and Great Britain and became very influential with the anti-slavery forces. By the end of her career, Harriet Beecher Stowe had written over 30 books. A noted abolitionist herself, it seems only fitting that Harriet Beecher Stowe is a cousin of the famous abolitionist John Brown. She also has kinship to a number of U.S. Presidents including Grover Cleveland, Franklin D. Roosevelt, Rutherford B. Hayes, Howard Taft, Calvin Coolidge, Gerald Ford, Richard Nixon, Benjamin Harrison, Herbert Hoover, and both Presidents Bush. 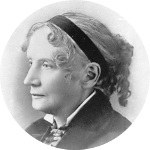 Harriet Beecher Stowe's celebrity kin include John Wayne, Ted Danson, Katharine Hepburn, Humphrey Bogart, Vincent Price, Anderson Cooper, Anthony Perkins, Jodie Foster, Kate Upton, Brooke Shields, Oliver Platt, Lucille Ball, and Shirley Temple. Her literary kin include Ernest Hemingway, Emily Dickinson, Ralph Waldo Emerson, Tennessee Williams, Edgar Rice Burroughs, and Agatha Christie.